This 9.9-mile reach of the Guadalupe River in Comal County is lined with an abundance of mature trees and a spectacular mix of limestone cliffs and shelves. 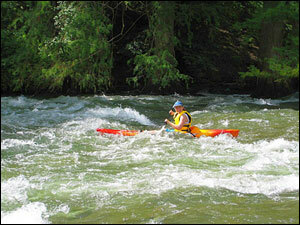 Paddlers will enjoy an exciting 3-6 hour ride on a variety of rapids between gentle stretches. 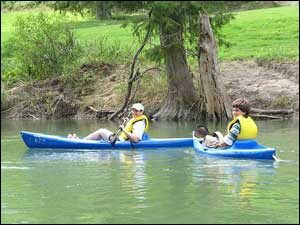 The put-in for this paddling trail is located on Old Spring Branch Road, just 3 miles west of Hwy 281 N, off Spring Branch Road. You can take-out at the FM 311 crossing, 2 miles southeast of Spring Branch. The last public access site above the Canyon Reservoir is at the Rebecca Creek crossing. Go about 3 miles east on Rebecca Creek Road off Hwy 281. Parking for shuttle vehicles at the FM 311 and Rebecca Creek crossing access points is free of charge, but be prepared to walk uphill to the parking area. Access to the Nichol's Landing site is free except on weekends and and during the offseason. On weekends and holidays during the summer when an attendant is on duty, parking and access costs $4 per adult and $2 per child (when parking a vehicle) and $1 per person (if dropping off without parking). Fees are used to maintain the access point. Please note: Alternate take-out at F.M. 311 is located 5.4 miles from Nichol's Landing. There are a number of rapids on the 10 mile stretch that demand careful inspection. Approximately 1.5 miles below FM 311 crossing a chute to the left of the island at Mueller Falls creates an exciting fast water run. About 5 miles below FM 311, a chute to the left of Rust Falls provides another exciting passageway. Hazardous areas can be portaged. Except during extreme droughts, there is always sufficient water for recreational use. 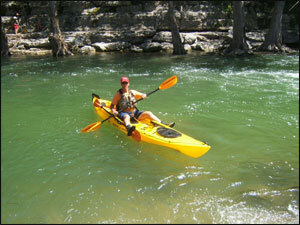 This rugged Hill Country river is known for clear-flowing waters and its extremely scenic beauty. This section of the river supports Guadalupe, white, striped, largemouth and smallmouth bass, gar, crappie, carp, and a variety of sunfish and catfish. Small lures such as jigs, plastic worms, spinner baits and light line are recommended. The high limestone bluffs, rugged shelves and boulders, giant bald cypress, pecan, cottonwood, oak, elm, and palmetto trees, and wide variety of shrubs and vines lining the river provide diverse habitat for deer, armadillos, raccoons, foxes, and squirrels. River beavers have also been sighted here. It is not unusual to see livestock watering in the river. For more information please see the TPWD Paddling Events calendar. Completed in 1966, the dam was built jointly by the United States Army Corps of Engineers and the Guadalupe-Blanco River Authority as a means for flood and drought management. The dam is 6,830 feet long and sits 224 feet above the stream bed. The Verada Real is a popular 6K walking and jogging path across the top of the dam with panoramic lake views and picnic tables nearby. In July of 2002, Texas received almost a year's worth of rain in a two week period. Water rushed over the spillway, washed out the south access road and destroyed 800 homes. The waters created a scenic gorge that the Guadalupe-Blanco River Authority and Gorge Preservation Society intend to develop as an educational resource. This trail was made possible through a partnership with the Water Oriented Recreation District of Comal County, Canyon Lake Chamber of Commerce, Alamo City Rivermen, Texas Rivers Protection Association, Guadalupe Blanco River Authority, and Texas Parks and Wildlife Department.